London: Chapman and Hall,, 1942. Octavo. Original grey wrappers. Housed in a black cloth folding case. Wrappers chipped at the spine and corners, detached and sometime reglued. Good. First edition, advance proof copy, the upper wrapper titled in ink by Evelyn Waugh, "Proof copy of Put Out More Flags by Evelyn Waugh" and with the author's presentation inscription to the half title, "P. C. Jones, from the author, 1942". This proof copy contains several textual variations not included in the published edition. London: Chapman & Hall, Ltd.. Very Good in Very Good+ dust jacket. 1942. First Edition. Hardcover. Very good original oatmeal cloth, dark blue topstain. Small dampstain to bottom front board corner and ffep corner, and to thin strip of bottom edge of front board. Foxing to text block edge. Unclipped jacket in protective cover has light edgewear. A tight square unmarked copy in unclipped jacket. ; 8vo 8" - 9" tall . London: Chapman & Hall Ltd.,, 1942. Octavo. Original purple and white cloth, titles to spine in blue, top edge blue. With the dust jacket. Bookplate. Pink pen trial to front free endpaper. A little rubbed and dulled at extremities, corners bumped. A very good copy in the rubbed, creased, and chipped jacket with dampstain to the spine panel and visible tape repairs to the verso. First edition, first impression. London: Chapman and Hall. 1942. First edition, first printing. First edition, first printing. Original grey textured cloth with blue titles to the spine, in dustwrapper. Blue top stain. A better than very good copy, the binding square and firm, the contents with a bookplate to the front endpaper are otherwise clean throughout and without previous owner's inscriptions or stamps. Complete with the rubbed and nicked original dustwrapper which has small chips and a few tears at the extremities, but retains much of the original colour to the spine, scarce thus. Not price-clipped (8/- to the front flap). Further details and images for any of the items listed are available on request. Lucius Books welcomes direct contact with our customers. Boston: Little, Brown, 1942. First American Edition. Very good to fine in a very good dust jacket. Condition: First American Edition. Very good to fine in a very good dust jacket. London: Chapman and Hall, 1942. First edition first printing published by Chapman and Hall in 1942. Grey mottled cloth boards with titles in black to spine, no marks to covers, just slight toning with age, no wear to spine tips or corners but slightly pushed, Book Society plate on front endpaper, dated 13th March 1942. Book has no inscriptions but has previous owners name and address blind stamped to front endpaper which also has a small crease top corner, no spine lean, pages are complete but foxed, top edge is blue, jacket is spine faded but titles are clear, no tears, no marks, price-clipped, top and bottom edge has been reinforced on verso at some stage and has left tape residue, the jacket has been covered in a protective covering which has helped it avoid tears. Rare in unchipped condition. 2003-06-09. New. Ships with Tracking Number! INTERNATIONAL WORLDWIDE Shipping available. Buy with confidence, excellent customer service! Chapman & Hall, 1942. 1st Edition. Hardcover. Very Good/Good. The jacket is a bit marked and torn - very little paper loss. One signature. A small (label?) scar to the front pastedown. The title page is stamped 'colonial edition'. There is a small indentation to the last few pages. Boston: Little, Brown, 1942. Gilt cloth. First U.S. edition. A bright, unfaded copy in dust jacket marred by a few short, internally mended tears at the crown of the spine. Chapman & Hall, 1942. 1st Edition. Hardcover. Very Good/Fair. the jacket is shelf rubbed and worn and marked. there is a chip at the top and bottom of the spine. the top is about 2cm, the bottom chip is a bit less but it also affects the front and back of the jacket. the jacket is not price clipped. the front end page has been removed. the boards are a little marked (where the chips are) no inscriptions and the binding is excellent. Chapman & Hall, London., 1942. First edition. Octavo. 256 pages. Basil Seal's war. Edges lightly spotted. Flaw at top of front pastedown (production fault). Very good in good, rubbed, chipped and faded dustwrapper with some less than professional restoration work. Chapman, 1942. 1st Edition. Hardcover. Fair/Very Good. The boards are a bit sunned, marked and worn. Soundly bound. Some foxing and an ownership inscription. Part of the ffep is missing. The jacket is a photocopy of an original. 2002-07-09. New. Ships with Tracking Number! INTERNATIONAL WORLDWIDE Shipping available. Buy with confidence, excellent customer service! 1977-01-06. New. Ships with Tracking Number! INTERNATIONAL WORLDWIDE Shipping available. Buy with confidence, excellent customer service! Boston: Little Brown, 1942. First US edition, first prnt. Spine cloth toned, beginning edge toning on the endpage; dustjacket with edgewear, chips at spine ends, wear with some loss on the flap folds, tape shadows on the flap edges and beginning toning on the spine. Tight copy in Very Good condition in a just Good dustjacket with an archival cover.. First Edition. Hardcovers. Very Good/Good. 8vo - over 7¾" - 9¾" tall. The images are of the book described and not stock photos. Boston: Little, Brown. 1977. Hardcover. Near Fine in a Near Fine dust jacket. ; 8vo 8" - 9" tall; Original unclipped dust jacket protected by archival Brodart cover. All domestic orders shipped protected in a Box. .
2017-02-28. Good. Ships with Tracking Number! INTERNATIONAL WORLDWIDE Shipping available. May not contain Access Codes or Supplements. May be ex-library. Shipping & Handling by region. Buy with confidence, excellent customer service! 1977-12-01. Good. Ships with Tracking Number! INTERNATIONAL WORLDWIDE Shipping available. May not contain Access Codes or Supplements. May be ex-library. Shipping & Handling by region. Buy with confidence, excellent customer service! London: Chapman & Hall, 1942. First edition. 256 pp. 1 vols. 8vo. Original heather brown cloth, small slits upper spine and back edge, spine darkened, pages browned else a very good copy. First edition. 256 pp. 1 vols. 8vo. Boston: Little, Brown and Company, 1942. Slightly cocked, a bit faded along edges. The seldom-seen dust jacket is frayed along edges, chipped at corners and extremities of spine, faded on spine, and tape-stained on back panel.. First American Edition. Cloth. Very Good/Fair. 8vo. London: The Book Club, 1943.. 8vo. 255, (1) pp. Publisher's red cloth, lettered black spine panel, dust jacket illustrated to the upper panel. Some wear to the extremities and a little soiling, an attractive copy. First published the year before. Boston: Little, Brown and Company, 1942. Near Fine/Very Good. Tenth (American) edition. Some scrapes and discoloration on the pastedowns, else near fine in very good dustwrapper with a couple of small internal repairs. Stamped on the endpapers as "Property of Little Brown & Co. Lending Library", whether this indicates an internal company or not is unclear. A curiosity. Boston: Little, Brown & Co, 1942. Hardback. Very good/Good. Little, Brown & Co, Boston, 1942. First US edition. Book condition: very good. Light general shelf wear and a little fading/soiling to edges. Light spotting to endpapers and to edges of text block. Very occasional spotting elsewhere. Small nick to edge of p125. Internally clean. Dust jacket condition: good. Some chipping with slight loss to head & tail of spine and to corners. Generally a little rubbed and light soiling. Spine somewhat faded. Waugh's clever dissection of 'smart' England, of Bohemian England, and of Colonel Blimp is as entertaining as only Evelyn Waugh can be. Little, Brown and Company, 2012. Hardcover. New. 9.75 x 6.5 cm. 2002-07-09. Good. Ships with Tracking Number! INTERNATIONAL WORLDWIDE Shipping available. May not contain Access Codes or Supplements. May be ex-library. Shipping & Handling by region. Buy with confidence, excellent customer service! London: Chapman & Hall, 1967. Hardcover in good condition. With a new preface by author. Dust jacket is lightly marked. Jacket spine is slightly tanned. One centimetre tear on jacket rear lower leading corner. Minor wear on hardcover spine ends. Spine is cocked. Leading corners are bumped. A few marks on page block. Plate on front pastedown. Contents are clear. AM. Hardcover. Good/Good. Used. Back Bay Books, 2002-08-15. Paperback. Used:Good. London: Chapman & Hall, 1942. 1st . Hardcover. Very good. Gift presentation to former owner on front end paper. Little Brown Company. Hardcover. 0316926159 New Condition. . New. Back Bay Books. PAPERBACK. 0316916056 New Condition. . New. Back Bay Books. PAPERBACK. 0316216429 New Condition. . New. Little, Brown and Company. Hardcover. 0316216410 New Condition. . New. Penguin UK. MASS MARKET PAPERBACK. 0140004238 New Condition. . New. Boston: Little, Brown and Company. 2012. Hardcover. 0316216410 . Near Fine in a Near Fine dust jacket. Clean, bright pages. 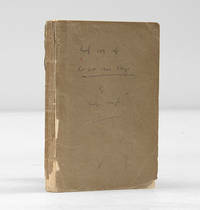 ; 9.90 X 6.40 X 1.30 inches; 304 pages; Original unclipped dust jacket protected by archival Brodart cover. All domestic orders shipped protected in a Box. .
1977-01-06. Good. Ships with Tracking Number! INTERNATIONAL WORLDWIDE Shipping available. May not contain Access Codes or Supplements. May be ex-library. Shipping & Handling by region. Buy with confidence, excellent customer service! Little, Brown & Co, 1977-12-01. Paperback. Used:Good. London: Chapman and Hall, 1948.. 8vo. 232, (2) pp. Publisher's blue cloth, gilt lettered to the spine, top edge blue, early ownership inscription to the verso of the front free endpaper, dust jacket. Some mild rubbing to the extremities of the jacket plus some tanning to the spine, else very good. First published in 1942, this copy was issued as part of a uniform edition of the author's works. LONDON: CHAPMAN & HALL LTD. VG+. 1942. CLOTH; INKNAME ON FFEP; . 2003-06-09. Good. Ships with Tracking Number! INTERNATIONAL WORLDWIDE Shipping available. May not contain Access Codes or Supplements. May be ex-library. Shipping & Handling by region. Buy with confidence, excellent customer service! London: Chapman and Hall, 1942. Boards have some light shelf wear and spine is cocked. Ink inscrip and ex-libris plate to flyleaf, foxing throughout. PP in good order aside foxing. Cloth Boards. Good/No Jacket. 8vo. Little Brown Company. Hardcover. 0316926159 Please allow 4 - 14 business days for Standard shipping, within the US. Thank you for supporting our small, family-owned business! . New. 1977-11-01. Later prt..
Little Brown Company. Hardcover. 0316926159 Please allow 4 - 14 business days for Standard shipping, within the US. Thank you for supporting our small, family-owned business! . Fine. 1977-11-01. Later prt..
Back Bay Books, 2012. Paperback. New. 8.25 x 5.5 cm. Little, Brown and Company. Hardcover. 0316216410 Like New Condition. . Fine.